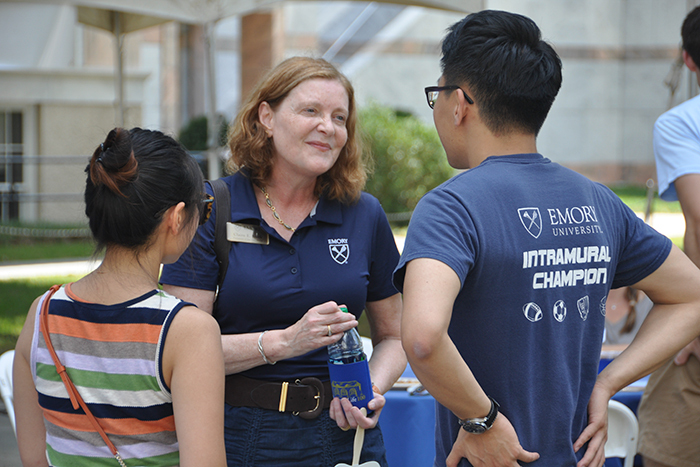 When Emory College's Class of 2020 arrived on campus Saturday, Aug. 20, for Move-In Day, President Sterk was among the enthusiastic volunteers greeting new students and carrying their belongings into residence halls. President Sterk also led the beloved Coca-Cola Toast, a favorite tradition welcoming each new class to Emory. On Tuesday, Aug. 23, President Sterk gave the address for Emory Fall Convocation, discussing "Getting Engaged – You and Emory!" 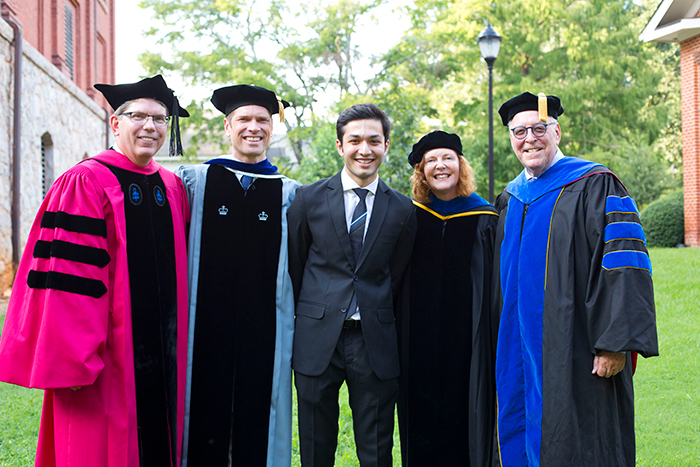 Steeped in ceremony and tradition, Emory Fall Convocation marks the official start of the academic year. President Sterk was also among the speakers for Oxford College's opening convocation, held Wednesday, Aug. 24. 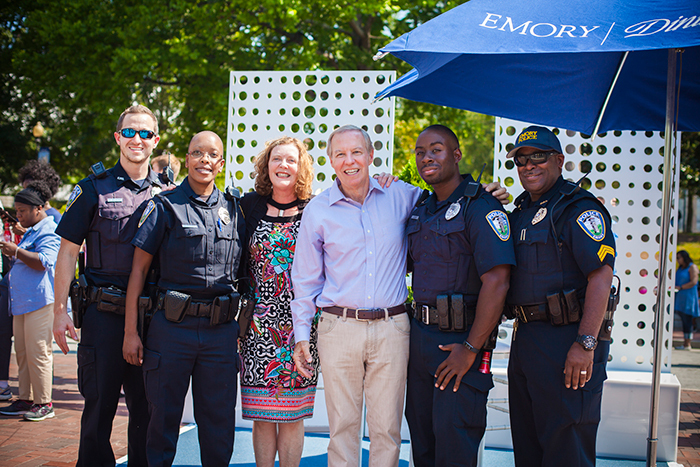 The Emory community officially welcomed President Sterk to her new role with a special block party held Friday, Sept 9. 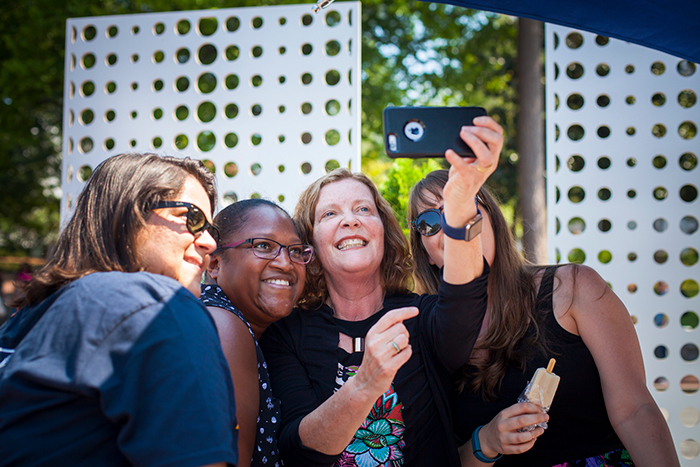 For many, the moment also created an impromptu photo opportunity, as a steady stream of friends old and new snapped selfies with President Sterk throughout the event. President Sterk and her husband, Rollins School of Public Health research professor Kirk W. Elifson, greeted well-wishers who also enjoyed live music and free food and drinks. Students and alumni celebrated Homecoming 2016 with dozens of events, culminating on Saturday, Sept. 24, with the annual Homecoming parade, festival and concert. 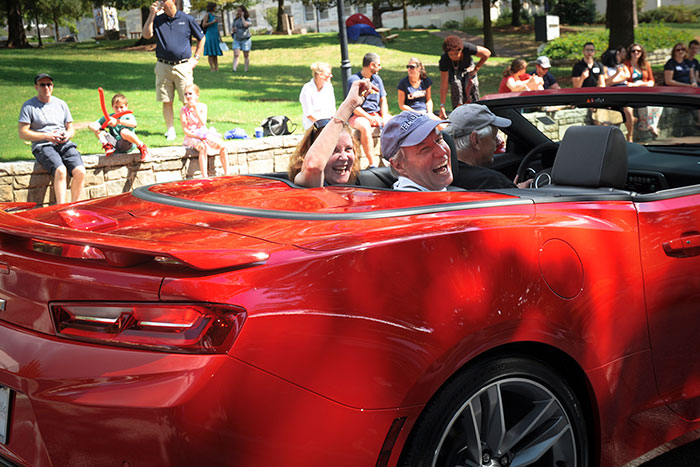 Sterk and Elifson joined the celebration, riding in the parade and visiting with students and alumni. 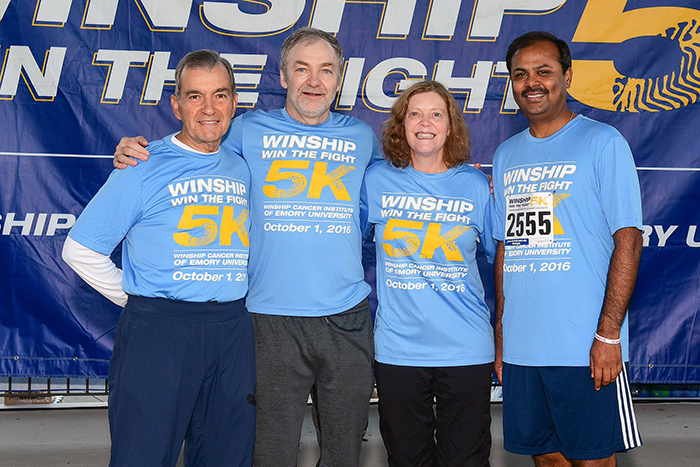 The annual Winship Win the Fight 5K Walk/Run, held Oct. 1, raised a record level of cancer research funding and drew more than 3,000 runners and walkers. 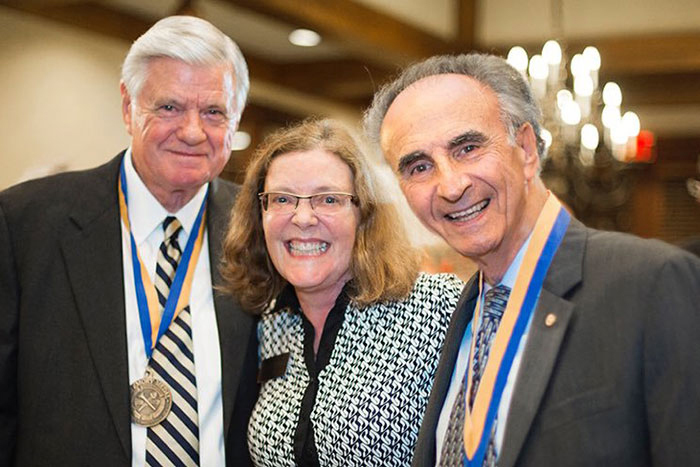 Charles H. “Pete” McTier (left) and S. Perry Brickman, the 2016 recipients of the Emory Medal, posed with Emory President Claire E. Sterk at the Nov. 3 medal ceremony. 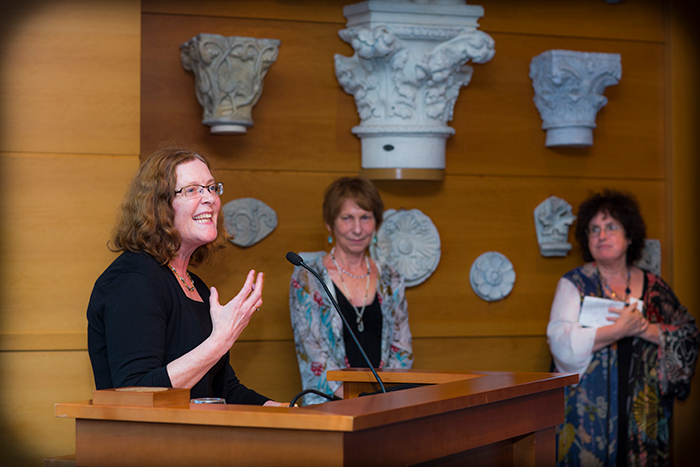 President Sterk welcomed guests to a special reception Nov. 4 marking the arrival of "First Folio: The Book that Gave Us Shakespeare" at the Michael C. Carlos Museum. 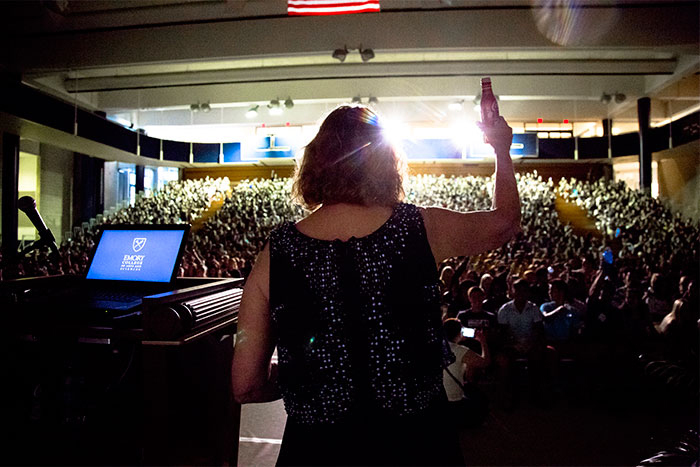 Hosting the First Folio is a "once in a lifetime moment" that Emory is sharing across the university and into the broader community, she said. 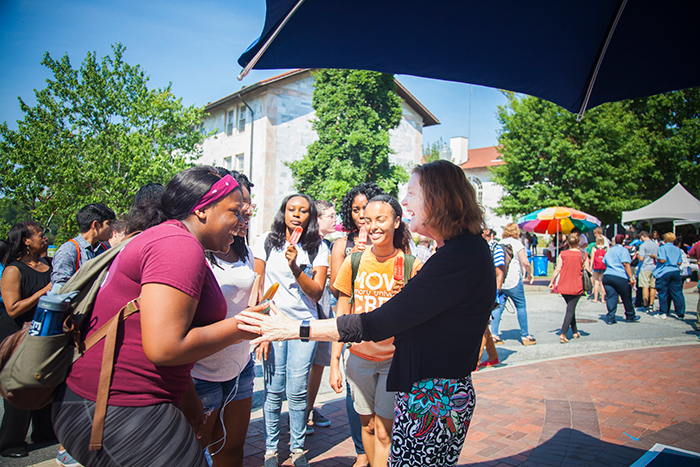 Emory President Claire E. Sterk has been a visible presence on campus throughout her first semester at the helm of the university, joining in traditions including Move-In Day, Fall Convocation, Homecoming, the Emory Medal Ceremony and more. For tickets to the academic symposium and inauguration, or to watch a livestream of these events as they take place, visit the website of the Office of the President. • A Celebration of Emory’s History and Traditions, Oxford Campus, 7-8:30 p.m. Celebrate the university’s origins and traditions with a walking tour of the central Oxford campus, where Emory was founded. Dessert reception follows. • Revelations, Michael C. Carlos Museum, 5:30-7 p.m.
Emory alumni are invited to register for a special reception to meet acclaimed artist and Emory PhD student Fahamu Pecou, who will reveal his commissioned inaugural art piece in honor of President Sterk. For more information, visit here. • Inauguration Academic Symposium: Health Challenges and Bold Opportunities, Glenn Memorial Auditorium, 7:30-9 p.m.
Carlos del Rio, Hubert Professor and chair of the Department of Global Health, moderates a discussion on global health challenges featuring Michel Sidibe, executive director UNAIDS, the Joint United Nations Program on HIV/AIDS, and under-secretary-general of the United Nations; Deborah Watkins Bruner, associate director for mentorship, education and training at Winship Cancer Institute and professor in the School of Nursing and School of Medicine; and Elaine Walker, Samuel Candler Dobbs Professor of Psychology and Neuroscience, director of Emory's Development and Mental Health Research Program. This special convocation blends Emory traditions and modern ceremonial elements. Emory neurosurgeon and CNN chief medical correspondent Sanjay Gupta provides the keynote address. The program includes a performance by the Vega Quartet and a poem by Kevin Young, University Distinguished Professor and Charles Howard Candler Professor of Creative Writing and English. When Emory President Claire E. Sterk participates in the time-honored rituals of formal investiture as the university’s new leader this week, the ceremony will mark a historic appointment, on many levels. In June, Sterk was unanimously selected by the Emory Board of Trustees to serve as the university’s first female president. A native of the Netherlands, the internationally acclaimed public health researcher will also be Emory’s first president who is a social scientist by training. Sterk joined the Emory community in 1995, when she was appointed to the faculty of the Rollins School of Public Health. During her tenure here, she has served the university as a professor, researcher, academic leader and administrator. In 2013, she was named provost and executive vice president for academic affairs. On Sept. 1, Sterk assumed the role of Emory president, succeeding James W. Wagner, who retired after 13 years in the office. 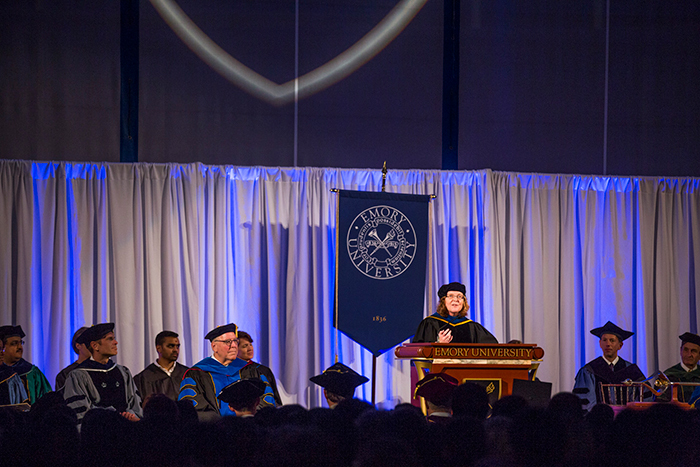 As Sterk and the Emory community prepare to celebrate her formal inauguration, Emory Report caught up with Sterk to talk about her experience to date and her direction for the future. 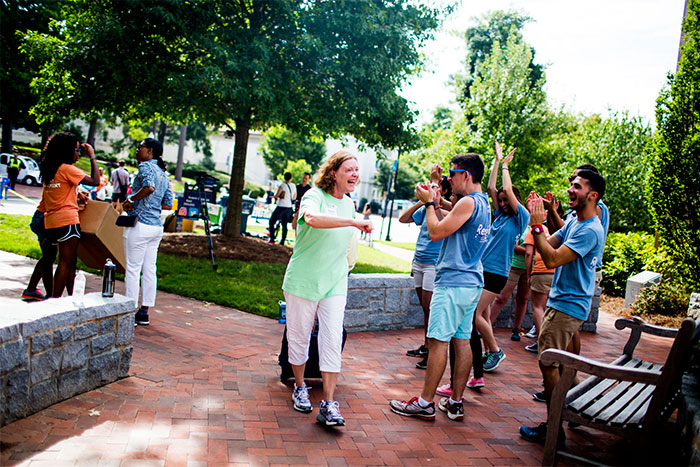 You’ve completed your first semester as Emory’s president. What has the experience been like? I’ve had such a warm welcome from people sharing their hopes and ambitions. Right after the announcement that I’d been selected, I had more than 1,000 emails of support — some from former students and colleagues from more than 20 years ago, as well as from numerous members of Atlanta communities in which I have worked. The outpouring of support has been energizing. One highlight from my first weeks in this role was Move-In Day for our first-year students. I spoke to an assembly of parents of our incoming class, and so many parents lined up afterwards to talk personally with me. The international parents especially were comforted by the fact that I am from another country. They felt good about putting their adolescents in our hands. You recently invited campus dialogue about a series of four emerging priorities for the university. How will those priorities help define the direction of your leadership for Emory? I’m a big believer in inclusive processes and was encouraged by the wonderful turnout and engagement at the January sessions. Feedback is extremely important in helping vet and shape the emerging priorities. In general, the conversations during these meetings revealed a powerful cohesion around the priorities that are developing. You may know that I’m an avid gardener. I even like to weed. I tend to see these priorities like a garden, with new ideas blooming where we’ve planted seeds. Some of the seeds will need longer to take root and grow. In other areas, Emory already has prepared fertile ground and is ready to harvest its efforts. I also see cross-pollination from one priority to another. In fact, in the final version of these priorities, some may merge with others, where we find organic, overlapping themes. As the university prepares for your inauguration, what are your reflections about what the experience symbolizes, both for you and for Emory? Inauguration is a time when an institution pauses to reflect on the big picture. It comes with traditions that remind us that an institution is grounded in history and that we stand on the shoulders of those who came before us. Inauguration also is a forward-looking event that ushers a new era. 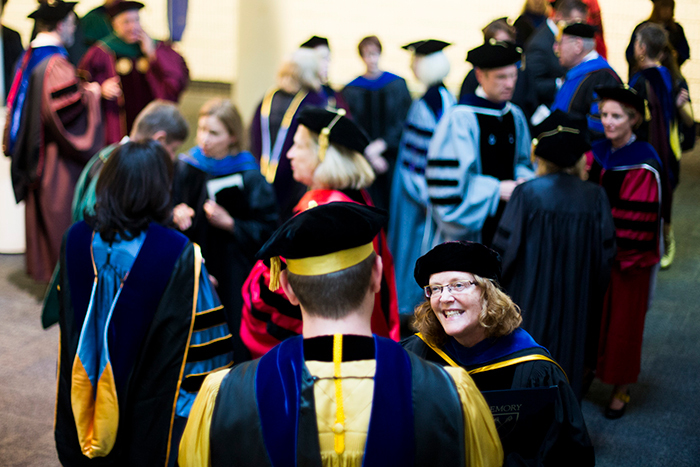 It is a special time in the life of Emory to envision where we will go next. For me, inauguration is an opportunity to consider the impact Emory is ready to bring to the world. It is a time to share the passions and dreams of our community and how I believe we can make our dreams into realities. Your inauguration also marks a historic moment in the life of Emory. What are your thoughts on serving as the university’s first female president? If you think about it, the Board of Trustees was courageous in making my appointment. Not only am I the first woman to lead Emory but also its first leader to grow up in another country and its first president who is a social scientist by training. In drawing up the presidential prospectus, the board also signaled a major change for its next leader. It asked for a president who is externally focused and is willing to lead the university in making a bold leap forward. Usually you don’t do that by going with the internal candidate. So, again, the board showed boldness in their choice. I feel a great sense of gratitude for the faith placed in me. Likewise, I feel a great responsibility to build on Emory’s history and potential to lead Emory to claim its ambition. What will be your next focus for leading Emory? Do you have a sense of what the year will bring? We’ve already started the process to define the next priorities for the university. An overarching priority that touches on all that we do is academic excellence. By partnering with the deans, faculty, students and staff from across the university, Emory has a chance to remove barriers to working across school boundaries, to share ideas and collaborate across disciplines, and ultimately to make choices about how and where it will excel. Another emerging priority has to do with a deeper engagement with Atlanta, and through Atlanta, with the world. To transform these priorities into realities, it is necessary to have the resources to support them. So I know that the future also will bring the opportunity to plan a campaign. Maybe more important than anything else I will do is to tell the Emory story. Emory people are making transformative discoveries and committed to sharing their knowledge to make the world a better place. To achieve what we want to achieve in the world, we have to get out the word on the remarkable work that is going on at Emory University. I consider my number one role to be the storyteller-in-chief.